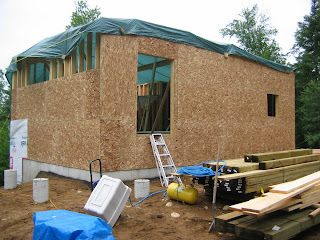 Generally the sheathing of the walls is applied at the same time as building each wall. However we took a different approach. 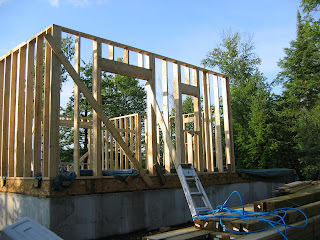 We framed each wall and stood them up without attaching the sheathing. The main reason was weight. With only two person crews most of the weekends, and often just myself and my wife, the added weight of the sheathing would make the walls just too heavy to lift into place safely. So the two pictures show the before and after the sheathing. There was another considerations. I wished to cover the whole exterior in a seamless sheathing - from below the floor joists right up to the top plate of the walls. This makes for a very strong bond between the main floor walls and the rest of the building. It is a little bit more difficult to apply the sheathing but the end result is worth it.